For the past few years we've been following research into the emergence and evolution of an emerging avian-origin canine H3N2 virus, which first appeared in Korea nearly a decade ago, moved into China, and appeared in the United States in the spring of 2015. Unlike the canine influenza virus (CIV) that emerged in North America in 2004 (H3N8) which jumped from equines, the HA and NA genes from A/canine/Korea/01/2007 (H3N2) are closely related to those identified in 2003 in chickens and doves in South Korea. Over the next few years CIV H3N2 spread into China, and in 2011 a study that appeared in the Journal of General Virology, showed that it had begun to infect cats as well (see Korea: Interspecies Transmission of Canine H3N2). The plot thickened again when we saw evidence of reverse zoonosis, resulting in a Canine H3N2 Reassortant With pH1N1 Matrix Gene, producing a novel hybrid between the 2009 H1N1 virus and CIV. And just last April, in A Canine H3N2 Virus With PA Gene From Avian H9N2 - Korea, we saw yet another example of CIV reassortment, this time with an avian virus. The Canine H3N2 virus is very much a work in progress, as it continues to evolve, to expand both its geographic and host range, and to reassort with other viruses. All of which serves as prelude to a study, recently published in the Archives of Virology, which finds `significantly enhanced virulence' in mice infected with one of these H3N2/H1N1pdm reassortant viruses. An outbreak of a canine influenza virus (CIV) H3N2 reassortant derived from pandemic (pdm) H1N1 and CIV H3N2 in companion animals has underscored the urgent need to monitor CIV infections for potential zoonotic transmission of influenza viruses to humans. In this study, we assessed the virulence of a novel CIV H3N2 reassortant, VC378, which was obtained from a dog that was coinfected with pdm H1N1 and CIV H3N2, in ferrets, dogs, and mice. Significantly enhanced virulence of VC378 was demonstrated in mice, although the transmissibility and pathogenicity of VC378 were similar to those of classical H3N2 in ferrets and dogs. This is notable because mice inoculated with an equivalent dose of classical CIV H3N2 showed no clinical signs and no lethality. We found that the PA and NS gene segments of VC378 were introduced from pdmH1N1, and these genes included the amino acid substitutions PA-P224S and NS-I123V, which were previously found to be associated with increased virulence in mice. Thus, we speculate that the natural reassortment between pdm H1N1 and CIV H3N2 can confer virulence and that continuous surveillance is needed to monitor the evolution of CIV in companion animals. 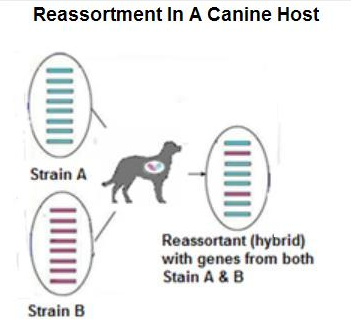 As companion animals, dogs and cats are continually exposed to human flu strains and are increasingly viewed as potential `mixing vessels’ for influenza reassortment (see Study: Dogs As Potential `Mixing Vessels’ For Influenza). None of this is to suggest that canine influenza is on the verge of becoming a human health threat, but as the CDC notes in their Canine Flu FAQ, there are good reasons to watch viruses like these very closely.